Sassy Brit @ Alternative-Read.com Allison Pang, Sassys Whats on your desk Wednesday? book blog meme, Simon and Schuster UK, Weekly Event, WOYDW? Click the picture to have a nose around...I do! My desk is a cluttered mess. Much like my life. You’ll see multiple phones, books, children’s homework, crayons, a broken pen, manga, David Garrett DVDs, business cards, a Hello Kitty mousepad. Clever people will even notice the cheerio on the keyboard tray, thanks to my thoughtful four year old. The picture doesn’t show the upper shelves – there’s a wacom tablet and a bunch of computer WoW boxes, some anime, my Kindle and three packs of Tarot cards. There is a monkey skull and crossbones patch on my chair. The armrest is breaking down on the right side because I have a tendency to lean on it very hard. I’ve cleaned it up from time to time, but it doesn’t take much to turn it into a complete wreck within a few days at the most. Part of this is lack of time. I work full time and have young kids. I have a limited time to write – mostly between 10 PM and 1 AM. I could waste that time on cleaning, or I could write. 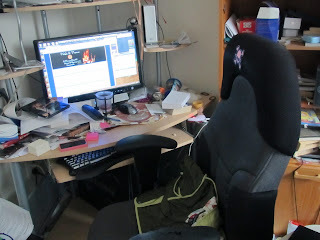 So, the clutter takes a back seat. To be honest, I find a clean desk to be far more distracting than a messy one. It’s pretty to look at for a while, but it’s empty. Allison Pang - Author of A Brush of Darkness. Don't forget to check out my giveaway below! 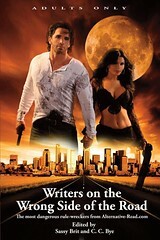 Allison Pang's 'A Brush of Darkness' Urban Fantasy paperback. SASSY SPECIAL: Offer entitles you to all the benefits of Audible membership during your 14 day free trial, including: a free audiobook of your choice from our range of over 50,000 titles, exclusive member discounts, access to our popular Members' Page, free gift downloads and more. If you decide that Audible isn't right for you, you can cancel at any point and keep your free audiobook. It looks a lot like mine. I don't have small children, but I do work a fulltime job that is an hour's drive away from my home, so I know exactly what you mean. Beleive me, if I could ride a bus or train I would. It would give me more time to write...or sleep. As long as you're still writing and YOU know where everything is, it's all good. Keep up the good work.